In December we held the first first ever desert aid volunteer camp in the Ajo Corridor, coordinated and hosted by a collection of humanitarian groups from Southern Arizona concerned with properly addressing deaths in the desert. We were able to successfully drop over 800 gallons of water but were also faced with the sobering task of carrying out a total of 6 skeletal human remains recoveries, all within the month-long period. It is with this in mind that Phoenix & Tucson No More Deaths have come together to host a second camp during May, as temperatures begin to rise and it is common to see numbers of casualties increase. 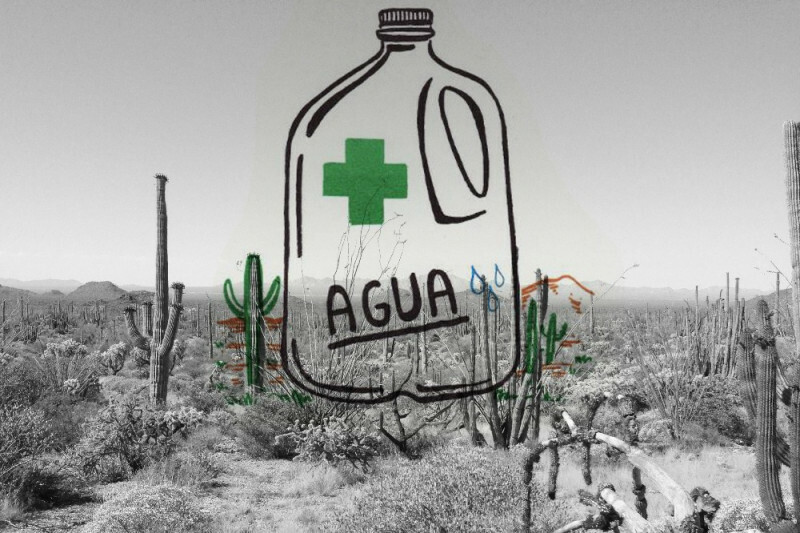 While our numbers and ambitions for this camp will be focused mostly on water & food drops, we will continue to collaborate with a range of groups to make it happen including local residents from the Phoenix, Tucson, and Ajo region. Our efforts will also be focused on continuing searches and attention towards the areas where many of the human remains recoveries took place in December. 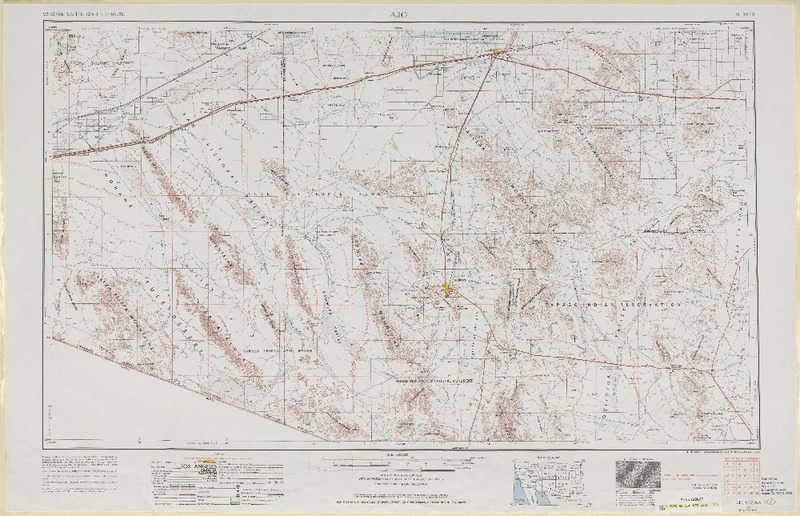 The Ajo Corridor is among the deadliest in the US, with upwards of 80 human remains recovered in the past two years alone. It is not uncommon for undocumented border crossers to be faced with up to two weeks of traveling through the hostile terrain by foot- leaving them vulnerable to dehydration, heat exhaustion, as well as hypothermia in winter months. The camp will include several areas of direct service and humanitarian aid work including providing food, water, and emergency first aid. Search and rescue/recovery operations will also be carried out during the month. Your donations will provide support for the volunteers and facilitators at camp, supplies, and equipment. To help illustrate these direct needs we've included a breakdown of costs below and where major funds are needed. Your donations will help make another camp happen. Thank you for continuing to support our efforts & for addressing the serious humanitarian need of this region- we will be sharing our work along the way for anyone wanting to keep up with our efforts throughout the month. Follow along at No More Deaths FB, No More Deaths Phoenix FB, and on Instagram @AjoNMD . THANK YOU!!! We're so thrilled to already be over half-way to our new goal since re-launching the page for May's volunteer camp. It has been a busy couple of weeks on the ground & we will be sharing more details on everything happening in the coming days. Please continue to keep sharing this page- we're so grateful for all the support received so far. Follow along with with posts on Phoenix No More Deaths FB and on IG at @Ajonmd. Sincere thanks for all who have shared/donated/sent good wishes. Each of you has helped us to keep this work going. This short film below shows some of the work done by No More Deaths in this region for those of you looking to learn more. 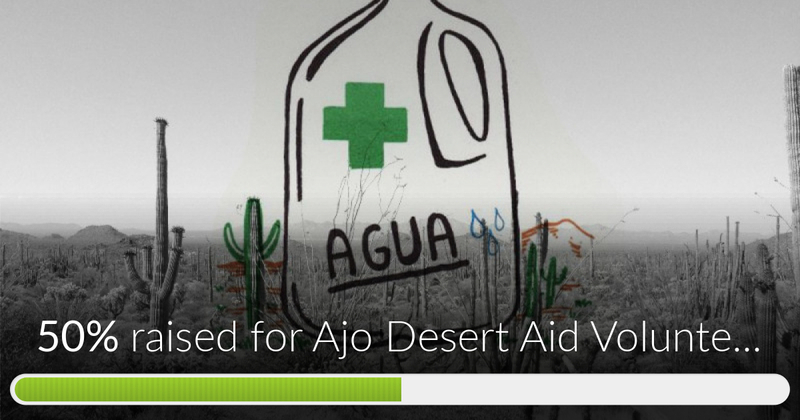 Ajo Desert Aid Volunteer Camp has reached 50% of its goal. Sincere thanks to all. Death should not be the cost of seeking a better life. Chris F. and his fellow compassionate associates are an inspiration to all. Thanks for caring about and doing something for those in danger.